For those counting, that’s four points on 2-of-5 from the floor with one rebound, zero assists, two turnovers, and two crucial missed free throws. Somehow, Durant’s fourth quarter was even worse than his stats. Stars, of course, are allowed to have off nights, but for the first time in these playoffs, Durant looked physically overmatched by the Heat’s defenders. On several possessions in the second half, Durant allowed LeBron James to push him into bad spots on the floor. More than anything, Durant’s tentativeness (probably the result of foul trouble) and his inability to establish himself in his usual spots on the floor were what contributed to the Thunder’s offensive meltdown down the stretch. Once Durant left the game in the third quarter, Russell Westbrook clearly put it on himself to take it over, and reminded every Thunder fan why they get an uneasy feeling in the pit of their stomachs every time he gets that look in his eye. Westbrook himself has been a study in player management throughout these playoffs. Much to Oklahoma City coach Scott Brooks’s credit, those “Russell being Russell” quarters have been toned down into “Russell being Russell” moments. After his “Russell being Russell” moment in the third quarter Sunday, Brooks immediately pulled Westbrook from the game. I wonder if this is the right strategy — Westbrook is going to have stretches where he takes terrible shots, but if the Thunder want to come back and tie the series Tuesday, they’re going to need Durant to reestablish himself physically and they’re going to need Russell to be Russell. They’ve gotten to this point by taking the good with the bad from Westbrook. Now is not the time to be tentative and try to figure out a way that Serge Ibaka or one of the Thunder’s role players can somehow win the series. Your move, Good Job, Good Effort Kid. Runner-up for GIF of the night. Can barely stand how funny this is. “So, Mario. You finish that copy of The Art of Fielding I gave you yet?” Also, what does it say about Mario Chalmers that the first thing I thought when seeing this image was, Is Mario Chalmers having a goddamn postgame Blow Pop? 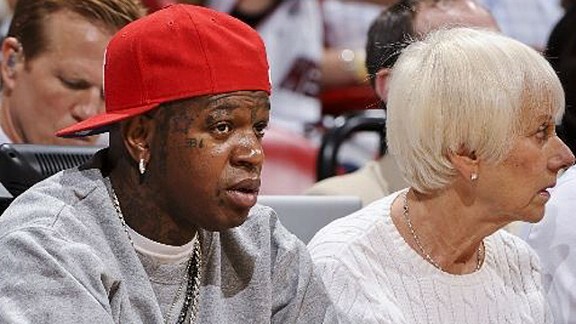 A YMCMB/Miami-Dade Senior Women’s Shuffleboard Association Production of a Film That Absolutely Needs To Get Made. The Thunder didn’t have a particularly effective time at the free throw line Sunday night. You might have heard. The same team that led the NBA in free throw percentage this year — hitting 80.6 percent of its shots from the charity stripe — went just 15-of-24 from the line against the Heat in Game 3. The natural argument against that math is that the Finals represent a clutch situation where regular-season statistics don’t apply. Well, that’s a testable hypothesis! As it turns out, the Finals don’t really represent some magic world where free throws become more difficult. From 1986 through 2011, the teams that made the NBA Finals shot 74.9 percent from the stripe during the regular season, and then shot 73.8 percent on free throws during the Finals themselves. If you can convince yourself that one free throw in a hundred represents teams wilting under pressure, go nuts. The other point that refutes the argument against Oklahoma City struggling under pressure is, well, that the Thunder haven’t been all that bad from the line during these playoffs. 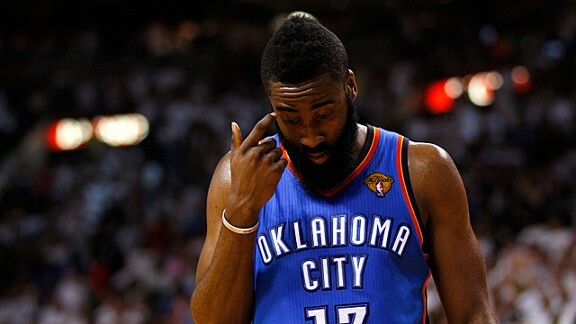 Before Sunday, Oklahoma City had shot 82.3 percent on free throws through 17 playoff games. And yes, they had been subpar in Games 1 and 2 of the Finals, going 39-of-53 from the line (73.6 percent), but think about the backward-looking logic that’s involved there. Are we to believe that the Thunder, down 2-0 to the San Antonio Spurs in the Western Conference finals, felt less pressure than they would be feeling during the first two games of the Finals? They promptly went ahead and shot 77-of-92 (83.7 percent) from the line over the final four games of that series. It’s not as if the Thunder could have peered into the future and realized that they didn’t need to stress out about hitting their free throws in Games 3 through 6 of the Conference finals because they would have more meaningful games coming up. Oklahoma City’s disappointing night wasn’t the work of choke artists, just randomness in a small sample. Oh, and since he’s the first person who comes to mind: What about Nick Anderson? Well, it’s entirely possible that Anderson’s famous set of misses during the 1994-95 Finals were because he faded under the spotlight, but it’s not clear-cut. The odds of a free throw shooter at Anderson’s level missing four consecutive free throws are about 117-to-1; much more unlikely than Oklahoma City’s night, obviously, but not in the realm of the extraordinary. And if the best argument against the broader facts presented above is what one player did on four free throws 17 years ago, well, that’s not very convincing. If Russell Westbrook’s game were a giant mixing console in a recording studio, Thunder coach Scott Brooks would probably want to slide the fader marked “RONDO” down a little bit. But that doesn’t make this any less fun to watch. James Harden = young, exciting, athletic, dunks hard, occasionally makes big shots, and, most important, has a signature beard. There’s a lot to like there, and the fact that he plays for a really good team has given him a nice reflected chunk of the publicity aimed at Kevin Durant and Russell Westbrook. But it turns out that bright spotlight might not be entirely positive. First off, there’s the flopping. I don’t know if he’s worst offender in the NBA or if I’m just noticing it more because he’s in the Finals, but watching him employ the gun-shot reaction 10 to 15 times per game is starting to get really obnoxious. Second, his two facial expressions are “mean mug” and “dead eyes.” I’m not totally convinced he has a winning personality. Third, and most egregiously, he waved off Durant with four minutes remaining in the fourth quarter Sunday night. Oh wait, let me write that the way it should be spoken: HE WAVED OFF KEVIN DURANT IN THE FOURTH QUARTER OF AN NBA FINALS GAME. You know the result; Harden lost the ball to Shane Battier on a drive, and LeBron James got the hoop-and-harm on the other end to put the Heat up six. Maybe I’m overreacting, but the wave-off seemed almost unforgivable. I’m at the point in my relationship with Harden where the fireworks have ended, and I’m forced to take a long walk and ask myself a tough question: Do I really like this guy? I Really Like This Guy! See, I like that. The Thunder need that. That guy who is saying screw you, your rings, your rep, and your legacy. You are about to witness the strength of beard knowledge. I know he had a terrible Game 3, but I don’t think the Thunder are even in the Finals in the first place if they don’t have Harden’s ever-churning engine of belief powering them. I know that Heat coach Erik Spoelstra being out on the court is really the least of OKC’s problems at this point, but I found this to be particularly egregious. It’s something that pissed off Sixers coach Doug Collins back in April. AIIIIIIIIIIIR RAAAAIIIIIIIIIIID. Feel like Jon Hamm should be narrating these high-performance Miami fast break clips. Until he has that trophy in his hands, there will always be the one indictment of LeBron James. Yet three games into these Finals, it feels like that’s the only one left. Since Game 6 of the Eastern Conference finals against Boston, all James has done is tick things off the list his detractors still seem content to point to. Whether the questions about his play are big (Can he take over with his team on the brink?) or small (Where is his post-up game?) hasn’t seemed to matter. One by one, he’s answered each nagging issue, and as James played a dominant power forward throughout the first half Sunday night, it was clear that in Game 3 of the Finals, he’d do it again. The post game was apparent in that 45-point epic against Boston, but Sunday night was more about asserting himself physically. James took the ball to the rim with the same lack of regard for human life that he often has, but what stood out was the aggression when he didn’t have the ball in his hands. He ended the game with five offensive rebounds (it felt like twice that), the most memorable of which came in the second quarter as James missed a layup and then tore the ball away from three Thunder defenders before going up again and drawing the foul. To go with his 29 points, James added 14 boards in all, two more than Kendrick Perkins. Perkins tallied 34 minutes Sunday night — 12 more than Serge Ibaka — and as long as Oklahoma City coach Scott Brooks keeps running him out there, the Heat will have the advantage when they throw James at the 4. It’s not hard to understand why people would want to see Kevin Durant take over the Finals. There’s an excitement in watching him heat up, in knowing that he can score and score easily from anywhere inside half court. In a lot of ways, it’s harder to get excited about rooting for LeBron, and the explanation for that goes beyond the non-basketball reasons people cling to. The scoring comes easily to Durant, but for LeBron, that’s how every element of the game is. Again, 29 and 14 felt quiet. Again, he took over a fourth quarter even though it didn’t feel like he did. And again, he was asked to be a bit of everything, and he was. It’s probably time to recognize what’s happening here. Because if the Heat do win, it doesn’t look like there will be anything left to say. Did you miss any of Grantland’s previous Shootaround coverage? Don’t worry! You can find it all here.